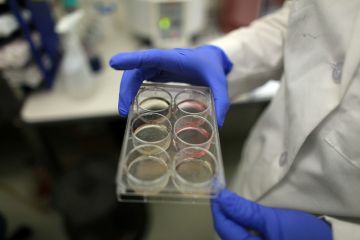 US scientists have made a breakthrough discovery finding stem cells in human ovaries from which it may one day be possible to produce an “unlimited” supply of eggs. The discovery could revolutionize fertility treatment, according to experts. Researchers at Massachusetts General Hospital were able to isolate the cells in a laboratory where they “spontaneously generated” eggs which they say are capable of being fertilized. Experts say the discovery challenges the prevailing view that women only have a certain number of eggs and can never produce any more, unlike men who go on producing sperm. In this sense it “re-writes the rule book” and could help infertile couples and also potentially allow women to remain fertile for longer, they added. The scientists managed to locate egg-producing stem cells in the ovaries of reproductive age women and grow immature eggs, known as oocytes. These appeared normal and when implanted in living human ovarian tissue – which was grafted inside mice – grew normally for two weeks. Dr. Jonathan Tilly, who led the study, said it “opens the door for development of unprecedented technologies to overcome infertility in women and perhaps even delay the timing of ovarian failure”. Dr. Jonathan Tilly’s team found the stem cells by searching for a protein called DDX4, unique to the surface of egg cells. For legal reasons, scientists cannot use these egg cells to create an embryo. But the same stem cells taken from mice were fertilized and produced embryos, according to the study published in the Nature Medicine journal. The latest advance could, if it works in further trials, change all that. Although using the technique in humans is probably some years away, Dr. Jonathan Tilly’s team is looking at putting the cells in a bank so they can be tested further and possibly used to improve IVF treatment and for women undergoing cancer treatment. A woman has the most oocytes as a foetus, about 7 million, dropping to about one million by birth, and 300,000 by puberty. By menopause, she has none left. Since the 50’s, scientists thought that ovarian stem cells capable of producing new eggs were only active during in the womb as a baby develops. Dr. Jonathan Tilly said this belief “was not actually based on data proving it was impossible, it was simply an assumption made because there was no evidence indicating otherwise”.